This photo is a close up of a blueberry. Using Macro diopters on the front of my lens, I arranged various nuts around the berry. 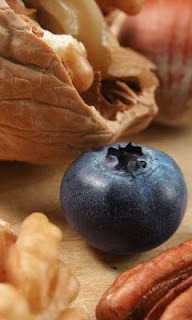 The nuts are earthy tones, warm tones while the blueberry stands cool and dark in contrast. I saturated the blueberry with Photoshop to give it a bluer appearance. Special note: When you do close-up photography the same rules apply as if you were doing a full-size still life. Note the rule of thirds applied, the foreground framing and the background design which balances the composition and leads the eyes to the subject. Sometimes you can't rely on auto focus to give you that sharp focus. Probably the most difficult focusing situation is when you have a moving subject obstructed by foreground elements. In this case Joan is riding her horse rapidly toward the camera with her face framed between two lances in the foreground. You can't possibly focus manually fast enough. How do you handle this? You PRE-Focus. 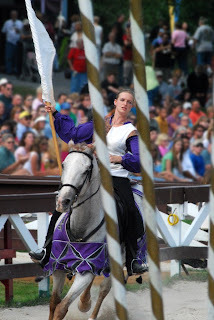 Pre-Focus on a spot on the field where you know the rider will be passing through, set your aperture on f/11 to f/16, shutter speed around 300th of a second and shoot about 5 frames a second as she fills the pre-focused area. Anytime a subject is moving toward you at a fast pace it is always a good idea to Pre-focus. 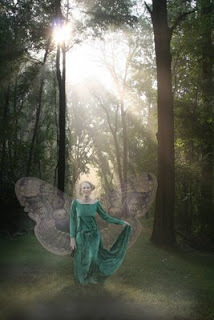 This is a Photoshopped altered reality image inspired by Shakespeare's Midsummer Night's Dream. It's called Titania (after the fairy queen in the play). There are three layer elements which make up this image. A tunnel to draw your eye to the subject and a diffused light source. The subject was an attractive model from a Shakespearean dress rehearsal (she is made subtlely translucent to give a "spirit" look). Costumes and permission all inclusive. The prop is a set of moth wings (notice that they are made considerably translucent with the opacity control). I chose moth wings because one of the fairies who introduced the magical element of Midsummer, speaking to Puck, called herself Moth. Moth wings rather than butterfly or bird wings gives the image a more foreboding and dangerous element. The spirits Shakespeare portrayed were not to be trifled with. A "wash" with a broad white paintbrush set at about 5% opacity creates a foreground mist.